Bust out those bell bottoms, Black Dynamite is coming home! This July, bust out your best polyester pants suit because Black Dynamite and his crew are about to explode onto the scene in all-new Blu-ray and DVD release, Black Dynamite Season One . The inaugural home entertainment release from the top-rated Adult Swim series will be available to own on July 15, 2014. Featuring all ten 30-minute episodes from the series' first season, the Blu-ray and DVD release also contains a host of bonus content including the original pilot, a behind-the-scenes featurette and video commentaries with series creator Carl Jones (The Boondocks) and cast members. 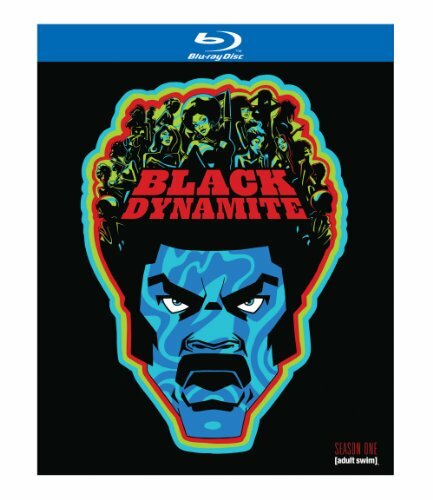 Black Dynamite Season One will be available for the suggested retail price of $39.99 on Blu-ray and $29.98 on two-disc DVD set, with a retailer pre-order date of June 10. Based on 2009's critically-acclaimed feature film, the Black Dynamite animated series further chronicles the exploits of the central character and his crew. Under the direction of Carl Jones, the series features the voice talent of Michael Jai White (For Better or Worse, The Dark Knight, Why Did I Get Married? ), Tommy Davidson (In Living Color, Bamboozled), Kym Whitley (The Cleveland Show, Brian McKnight Show), and Byron Minns (Mongo Wrestling Alliance), all of whom starred in the feature film. The animated series is produced by Ars Nova, with Jon Steingart, Carl Jones, and Jillian Apfelbaum as executive producers. Brian Ash is co-executive producer. Scott Sanders, Michael Jai White and Byron Minns are producers. Monica Jones is associate producer. Lesean Thomas is creative producer/supervising director. Original music is provided by Adrian Younge. Black Dynamite is being animated by Titmouse, Inc. The series' first season, which aired on Adult Swim during the summer of 2012, was the top-rated show in its timeslot for both adults and men 18-34, with more than five million adults and three million men tuning in to get a piece of Black Dynamite, according to Nielsen Media Research. The second season of the series will debut this summer on Adult Swim. Adult Swim (AdultSwim.com), launched in 2001, is Turner Broadcasting System, Inc.'s network offering original and acquired animated and live-action series for young adults. Airing nightly from 8 p.m. to 6 a.m. (ET/PT), Adult Swim is basic cable's #1 network among persons 18-34 and 18-49, and is seen in 99 million U.S. homes.